It was a hero's welcome such as Serbia has rarely ever seen: More than 50,000 people gathered in a central Belgrade square on Sunday night to welcome home Marija Serifovic, the winner of the 2007 Eurovision Song contest. Prior to her arrival from Helsinki, police cleared the 10 mile road from the airport into the city in order to speed her passage, and a banner draped across the City Hall read "Ave Marija." "I won for Serbia, I won for all of you!" the 22-year-old singer said to the cheering crowd. "It's a new chapter for a new Serbia." If, indeed, there is a tonic for struggling nations to be had from winning the annual Europe-wide contest of camp and kitsch that has produced such legends as Abba and was won, last year, by a Finnish rock band in monster costumes, then few needed it as much as the Serbs did. Days before Saturday's Eurovision finals, the country almost plunged back into bad old days, as the Serbian parliament chose as its Speaker the ultranationalist Radical Party leader Tomislav Nikolic. Nikolic, a former vice-premier in the government of Slobodan Milosevic, caused an outrage when he vowed to cut Serbia's ties with the West and eventually merge the country with Russia  not an easy task, considering that the countries are not neighbors. Nikolic was forced to resign only hours before Serifovic's plane landed from Helsinki. Soon after her return, Serifovic became the object of a parliamentary debate, as legislators from various parties each claimed her support. "Marija Serifovic and her mother Verica both endorsed our party during the [January] election campaign", said Rajko Djuric, a chairman of the Serbian Roma Union, a party representing ethnic Gypsies. "This is a shameless lie," retorted Aleksandar Vucic of the Radical Party. "Jasko Serifovic, Marija's grandfather, has been a member of our party since 1995." The debate was interrupted by the singer herself, when she paid a short visit to the parliament on Monday, during the debate on Serbia's new government. "I am politically neutral and I intend to stay that way" Serifovic told the legislators in the Parliament's lounge. "I keep my hands off politics, and I expect the politicians to keep theirs off my music," she said. But staying away from politics is hard in Serbia, as Serifovic must be aware. In the weeks prior to the Eurovision contest, she was subjected to vicious attacks by Serbia's virulently nationalistic tabloids, some of which focused on her Roma (Gypsy) ethnicity. 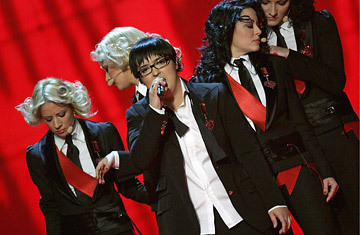 Others derided her looks, declaring she was "too ugly to represent Serbia," or tried to expose her as a lesbian. In her interviews, Serifovic persistently declines to discuss her private life and her sexual orientation. Probably the most outrageous story concerning the singer appeared on May 9, in the Serbian tabloid Press. It claimed that the Western powers fixed the Eurovision contest in order to ensure Serifovic's victory. "Lulled by a triumph in Helsinki, Serbs are expected to calmly swallow the imminent secession of Kosovo," the paper claimed. The status of Kosovo, the southern Serbian province populated mostly by ethnic Albanians, is currently being debated in the United Nations Security Council. The Western powers favor granting the territory independence from Serbia, while Moscow sides with Belgrade in opposing it. Still, the same paper that painted the Eurovision outcome as a conspiracy was no less ecstatic than its rivals in celebrating it: "Euromarija!" screamed a headline, accompanied by a sycophantic story. So the conspiracy must have been a success: at least for a day or two, a bitterly divided nation was united in celebration.